Feature-packed 2.4GHz chassis, minus body and transmitter! More power from the speed controller (ESC) and XSPEED MINI-Z Motor V for breathtaking acceleration! Imagine a robust chassis equipped with an advanced ASF 2.4GHz control unit and huge pneumatic rubber tires that fits neatly on the palm of your hand. Switch the power on and the reality of the MINI-Z Monster surges to life with amazing simplicity as the control system eliminates the need to manage frequency bands and allows up to 40 cars to be run simultaneously without signal interference. Also, the expanded capacity in the FET speed controller and the powerful XSPEED Motor V delivers a dynamic punch and blistering acceleration that easily lifts the front end from standing start. 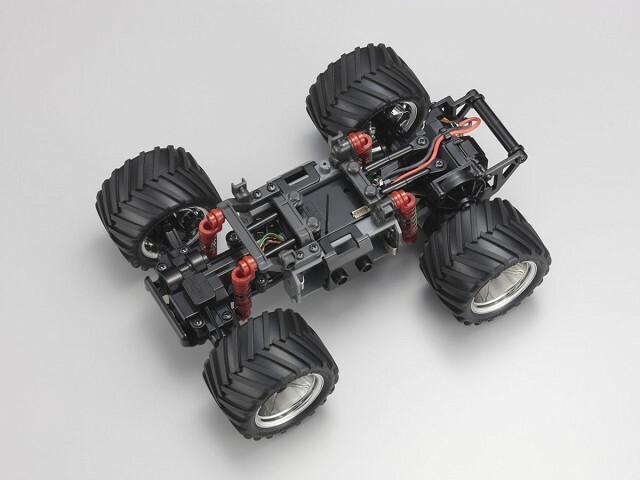 Packaged without body and transmitter, this chassis set makes an ideal 2nd or 3rd addition to your MINI-Z lineup. Complete chassis set with special 2.4GHz receiver cover. Features FET ESC with expanded capacity. Swing arms and parallel upper rods realize deep suspension stroke. Diff gear can be locked by installing the included diff-locking plate. Effective for hill climbing when extra drive power is needed. Complete chassis set without transmitter and body. Long stroke suspension extracts the best of big tire performance. King-pin located deep inside the wheel reduces scrub and realizes light steering control. Unidirectional pneumatic tires produce impressive running performance. Agility of the chassis executes wheelies and jumps with ease. Pre-installed high-power and torque XSPEED Mini-Z Motor V included as standard. Equipped with I.C.S. terminal that connects to a personal computer for precision setting adjustment. I.C.S. function provides adjustment of speed controller (ESC) drive frequency, virtual inertia effect, and steering characteristics. Wide variety of optional parts available. AAA-sized alkaline batteries x 4 or Ni-MH batteries x 4 for chassis. No crystals needed! 2.4GHz system blocks interference. Using 2.4GHz frequency, the transmitter and chassis automatically lock on to open bands with the 2.4GHz ASF system. Realizes a stable environment without interference so you can have confidence in your radio system's response. Allows up to 40 cars to be raced at the same time. Simple pairing process (registering transmitter with the chassis) also enables a single transmitter to be used with multiple chassis. The next generation of proportional radio control systems starts here.